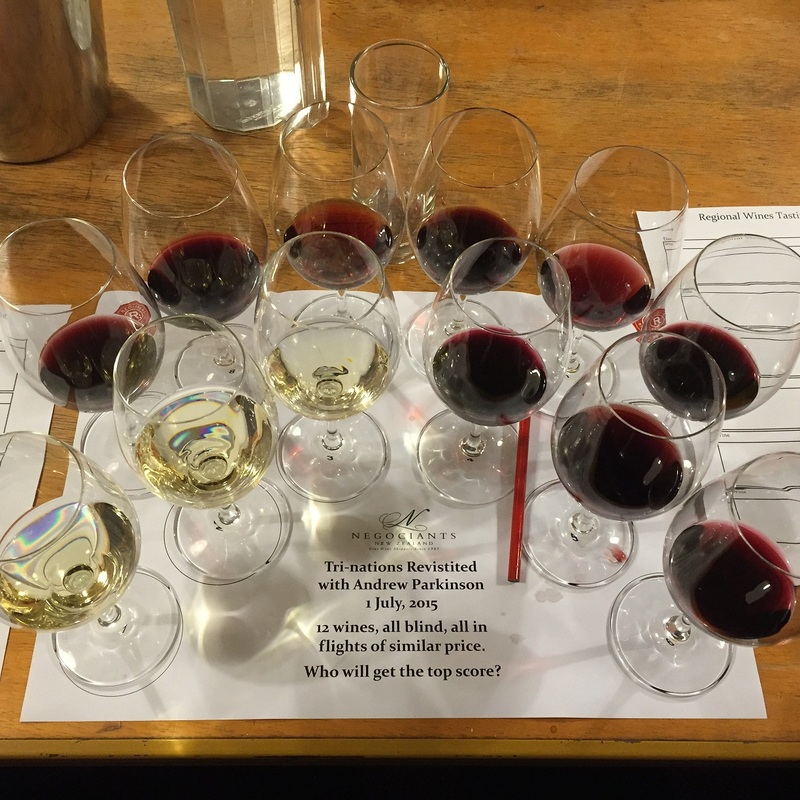 My mate D and I rocked up to Regional Wines for an evening tasting of fine Euro wines. Billed as a ‘Tri-nations’ tasting, we would be supping drops from France, Spain and Italy. We were hosted by Andrew Parkinson from wine importers Negociants and Richard Sherriff from RW. Pra Soave Classico 2013 – $$ – Italy – A smokey oaky mealy nose, like a Chardonnay. Fruity and light. Citrus flavours. It builds on the palate, textural. Fairly smelly to start, but it blows off. Very pleasant. I like. Finca Constancia Tempranillo Parcela 23 2013 – $$ – Spain – A lovely purple wine. Choc and vanilla. Lots of black fruits and plums. Rich and enveloping. Tempranillo fruit in 100% new oak. Age-worthy. Beronia Rioja Reserva 2008 – $$$ – Spain – Sweet lovely licorice flavours. Vanilla. Lifted aromas. Tannic. Rich and fruit-filled. Some coconut. Yum. Cos Tempranillo. Dom. Faiveley Gevrey Chamb. Les Cazietiers 1er Cru 2011 – $$$+ – France – I was proud to guess this as a Burgundy. I even thought it was a Faiveley Les Caz as well…Delicious. Pretty. Soft and supple. Very expressive wine. Dark cherries. Beautifully perfumed. Nice tannic line. Happy to have.